Purchased a brand new G19 Gen5 (Glock). Fired 300 of these rounds. Not a single jam. That could be the Glock, or it could be the ammo, but it's likely a combo of both. Pistol didn't get very dirty, either, which was a plus. This is the dirtiest ammo I've run through my Glock but having said that, it never failed to feed or eject. Great value and I'd buy it again if I needed to. 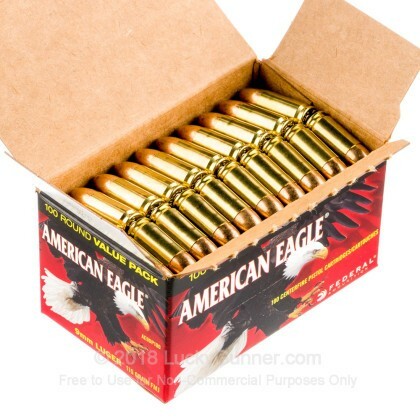 I use American Eagle regularly as my target ammo. Never a issue, regardless of caliber or grain. I’ll load up on these every once in while, suggest you do the same. Put all 500 rounds through both my Walther PPQ 4in and my new H&K VP9 SK without a single issue also picked up on sale. This is def my go to ammo. Put 350 through VP9 SK AND 150 through PPQ. This ammo is pretty much the only kind I shoot. No misfires and is fairly clean. I've shot about 2,000 rounds so far and no problems. All rounds were shot from a S&W M&P 2.0 9mm. LuckyGunner ships it very fast! Would recommend this type of brand to anyone. Great ammo, its all I ever shoot. Ammo that was purchased recently from Lucky Gunner was delivered on time and boxed up for shipment in a way that protected the ammo both for damage as well as being discreet. Once the ammo arrived I went with a buddy to the range and went thru a couple hundred rounds with out any miss fires. I will continue to use this brand of ammo because the high quality with out any miss fires, after shooting, the cleaning of the gun shows that the ammo burns very clean without a lot of unburned powder that was left on the mechs for additional cleaning. 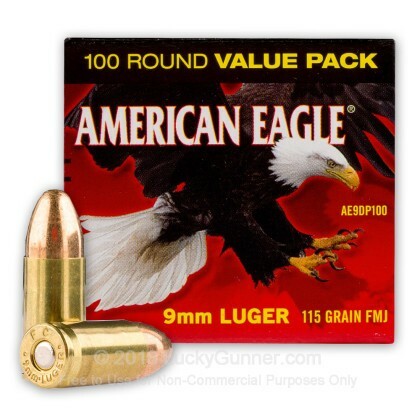 Another reason for the purchase is that the ammo is made in the good old USA !!! What a great bargain. Great customer service. Awesome delivery speed. Thank-you for being a great American business. I will be back for more. v/r/DB. I have probably shot 3000 rounds of this in two Rugers And a Glock. Always works well. No jams, no duds, consistent, and quite clean. No one beats luckygunner at online ammo! Fired thousand rounds of this American ammo,never a problem. Also very clean! Lucky Gunner service is terrific. Great ammo and tight groups from 10 to 15 yds in various Glocks and Sig P320. This ammo is slightly dirty but, if you clean you gun regularly then who cares. Overall Federal American Eagle performs flawlessly! I'm shooting and I notice my fingers are black. What the heck! I wipe them off and reload my magazine-- yikes my fingers are covered with black powder. I ordered a 1000 rounds, so far every box has been absolutely covered in powder that gets all over everything. There are so many good suppliers out there, way buy this junk. I have ordered this ammo before from LG and fed through a variety of guns without a hitch. You cannot go wrong with this product. Excellent round and great service from LG. Excellent product. My Springfield RO eats it like candy. Great service from lucky gunners, as usual. This is my second order and I ordered bulk because I have a lot of learning to do. Received my order faster than expected maybe because I am close or maybe because LG offeres good service! The Federal ammunition works fine in my HK pistol for practice; should I expect less? The product and quick delivery is excellent! Will recommend Lucky Gunner to all my friends! Bought 500 rounds from Lucky Gunner at a terrific price. Shot 250 at the range in the first outing with my new Kahr mk9 elite. Ever round FLAWLESS. Great buy! No misfires in 500 rounds. Lucky Gunner is the best! Great prices and fast shipping. Will be ordering again soon. Nice ammo to take to the range. Much cheaper than buying at the range. Federal American Eagle never fails to perform flawlessly in my Glock 19. It's my go-to ammo of choice for target and plinking. ammo functions well and very reliable. cant go wrong with federal, no issues period. Shipment arrived on time and no packaging issues. Put 150 rounds through my gun with no problems at the range. This is my fourth order and I'll be back for more. Excellent ammo - functioned well in Glock pistol! Will be ordering more! Federal 9mm great for rang use. Lucky Gunner is Outstsnding-Great Prices, Fast and Reasonable Shipping, Excellent Customer Service. I would HIGHLY recommend Lucky Gunner. Federal 9mm cant be beat at the range. No malfunctions. After shooting 1000 plus rounds of this ammo I have had zero malfunctions. This is my go to round when I feel like shooting a higher quality practice round. The boxing also makes for quicker reloading during precious range time. Bought a new Sphinx and was told to "be careful" with the ammo I used in it - have fired about 120 rounds of the Federal so far and have had not 1 problem. Excellent action and grouping - and I'm no "expert marksman" be any stretch. 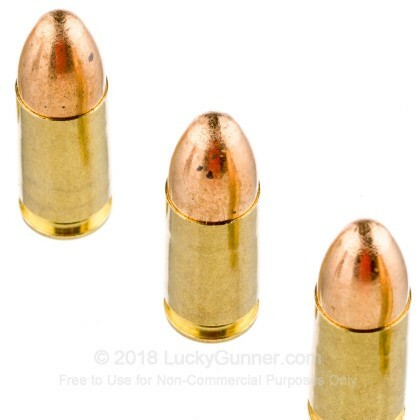 Have made several purchases of 380, 223 and 9mm from Lucky Gunner and the service and quality have always been exceptional. Would recommend in a heartbeat! I have used this site twice and the service was perfect both times. Good price on ammo as well. Always great service from LG. Ammo ran without fail in Walther PPS classic. Bought 500 rounds on a discount, and worked flawlessly. Already put 200 rounds through my sig 938 and it ate it up! No FTF or FTE. Lucky Gunner shipped it in two days, would have cost me more to drive and buy this many rounds locally. Price is great, ammo is great, will definitely buy it again! Great 9mm ammo. I will buy more. I have been to the range 3 times shooting the 9mm ammo in a new S@W Shield. Both have performed flawlessly. Let me know when you have a sale I will buy more. Ordering process was simple, ammo delivered on time and you just can't beat the price of Luckygunner.com. 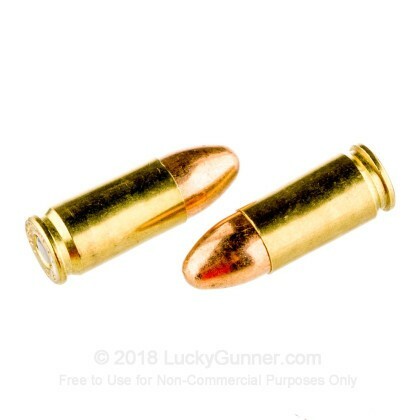 All of my ammo purchases will be thru luckgunner.com. I buy only name brand ammo, and I'm sure all I've purchased is quality, but most important is the service and pricing . . . . Top Notch. The site is great, timeliness is fantastic and follow-up shows you care about customers . . . you rock! I like it because, it's consistent load every time. Plus, I like the loose 100 round box's. I buy all my ammo from Lucky Gunner because of price and quality. I am basically a range shooter but I like clean ammo for the sake of cleaning my guns. I find buying through Lucky Gunner I get good prices and whatever quality I am looking for. Deliveries are quick and I have had no problems since I started buying here. Cheers keep up the great service and product offerings....Oh yeah this ammo rocks. used this ammo on my glock 19 and had no issues, i also get my order on time every time. My purchase came in very fast, and everything was efficient. I will definitely purchase here again, thank you. The 9mm 115gr FMJ ammo I purchased was right on the money for all my needs. I've made several purchases from Lucky Gunner and haven't been let down yet. For my ammo needs, I trust this company and the people I speak to when I call. If ever an issue was to arise with an order, I trust that I would be contacted by them without delay so that other arrangements can be made. But that hasn't had to happen. Their stock online has always been accurate and I have never ran into any issues. Keep up the good work and I will be ordering again soon. Thanks!! Ammo came fast and has worked well so far. No misfires. Good value & quick delivery. Didn't get to shoot but these AEs are normally good. Pricing was good. Great Value, arrived very quick! It was a great value and it arrived to my door very quickly. A very painless process! Great ordering process and exceptionally speedy delivery. My Glock likes it, but it eats everything I put in it. Can't go wrong with Federal. Always reliable. 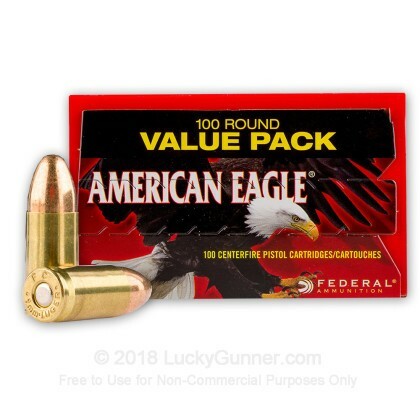 Good ammo at a great price. Well packed and fast shipping. Will buy more. These were bought to test out a 9mm conversion barrel. 200+ rounds in and not a single issue. My groupings with these are in line with the more expensive rounds. Cost allows me much more range time as well. I can now find ammo locally, but not in the quantities or selection I get at Lucky Gunner. I don't even think of buying anywhere else. Service is world-class! 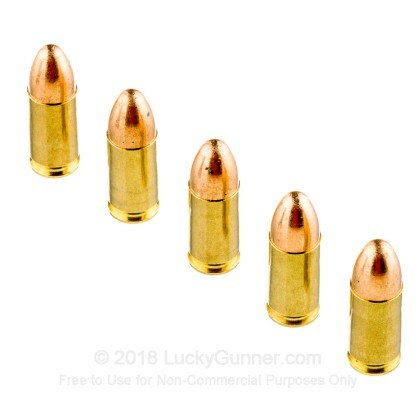 I especially like that I can buy ammo I've never shot (or heard of, sometimes) and feel confident ordering 1,000 rounds because of the honest reviews all of you provide. From ordering to shooting, I've never had a disappointing experience with Lucky Gunner! I have gone through 300 rounds with no problems and great accuracy. Very pleased with the ammo and overall service. Received the ammunition quickly and had a blast at the range! I own a Glock 19 Gen 4 and I had no problem with these rounds and sent 200 rounds down range last weekend. Very good value and a good round! worked just fine for me. the fact that it's bullets did not hit the black all the time was my fault not the ammos. Shot 100 rounds thru Shield, with no FTF ,looks like great range ammo ! Runs through my Glock and CZ with no issues. Good price, god customer service. Will buy again. Excellent in every area for shooting. Will purchase again. Great bye for the money. One day delivery outstanding. Will stay with LuckyGunner as my source for ammo. Works great in my Glock 26. No jams or misfires. Once again great customer service from Lucky Gunner. We have had no issues with this ammo, this is a great ammunition for going to the range. A: Hello Stephen! The velocity of this ammunition is 1160 fps with a muzzle energy of 344 ft. lbs.